I recently got a drive enclosure that allows it to be connected via eSATA or USB2. I got a nifty ExpressCard eSATA adapter for my MacBook Pro since eSATA is theoretically faster. Guess what? It is a lot faster! A simple test of disk performance in Xbench (sure, not the best test, but it gives me something to compare) revealed that the disk got more than double the score, with several of the speeds being more than three times faster. 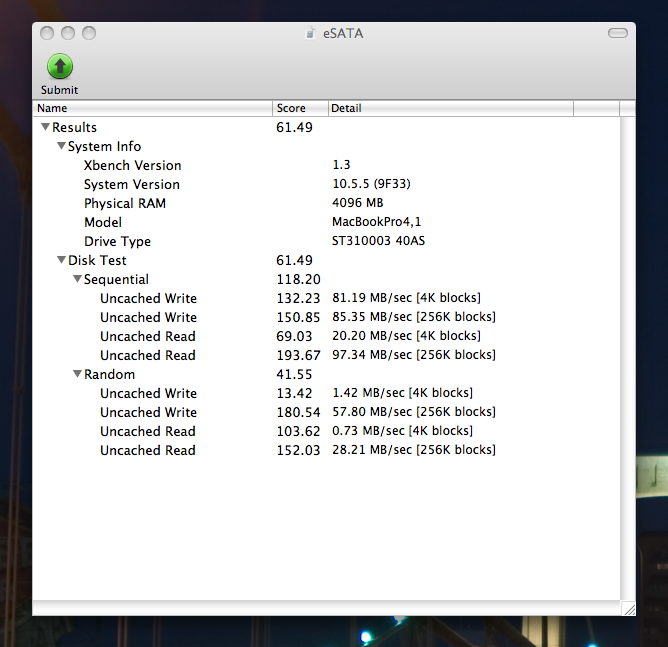 This is the same disk, all I did was run the “Disk Test” in Xbench then disconnected the eSATA connector from my drive enclosure, connected it up via USB and ran the same test again. Same drive, enclosure, computer; just a different cable and interface. I expected a little performance increase, but not that much. I suppose it could be the USB chip that is a huge pig, but I saw similar numbers with a different USB to SATA adapter. Regardless what it is, no more drives on USB for me, I’m a believer in eSATA!